You already know the library is full of books to borrow but did you know you could score free passes for the museum, record a song in a studio, or borrow a chocolate fountain—all for free? 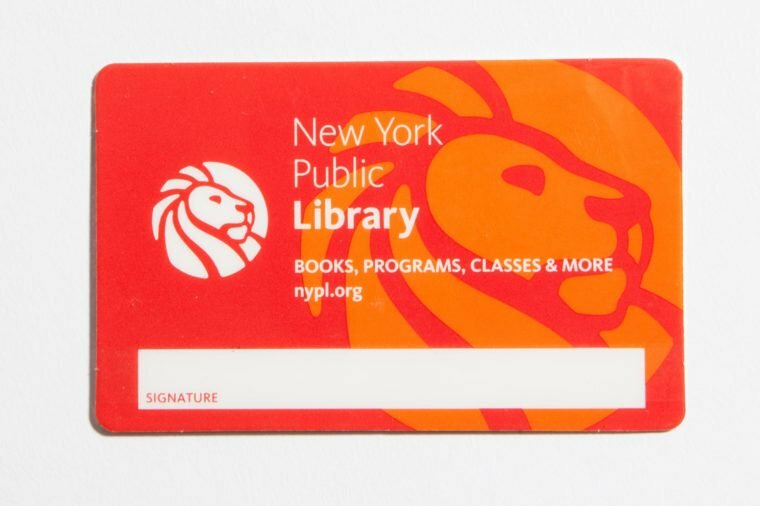 If you haven’t had a library card since your school days, you’ve been missing out. “Once someone walks into a library, they will find a myriad of resources that will motivate them to obtain a library card,” says Loida Garcia-Febo, president, American Library Association.These days you can borrow everything from a Wi-Fit hotspot to fishing poles, learn a new skill, or take the kids to the museum—all free of charge. Each library offers their specific services, based on what the library patrons request and the community at large. “Libraries take time to get to know the communities they serve by meeting with local civic, health, and religious organizations in their area,” says Garcia-Febo. Why just read about musicians when you can play like one? Individuals can borrow an instrument from a collection of musical instruments at the Sand Creek Library in Colorado, Garcia-Febo tells Reader’s Digest. Keyboards, acoustic guitars, and, yes, even a drum set are available to borrow. Better yet, you can also record a song at the library’s recording studio, potentially creating your first demo, adds Garcia-Febo. The library offers a fully-staffed working audio studio where budding or veteran musicians can schedule a one-hour session up to eight hours per month. You’ll never believe the crazy excuses for these overdue library books. When libraries get feedback from patrons, community members, and organizations about the needs and desires of the community they serve, the results can be delicious. According to Garcio-Febo, it was community input that led the Benson branch of the Omaha Public Library in Nebraska to give away seeds so patrons could grow fruits and vegetables. And at the Coventry Public Library in Rhode Island patrons can borrow fishing poles and tackle boxes. You wouldn’t expect to see an auto scanner in the library catalog, but this and many other gadgets are available for loan at the Darien Library in Connecticut. “We refer to it generally as ‘borrow a gadget,’ Amanda L. Goodman, publicity manager says. Some of the items in the catalog include a Wi-Fi Hotspot and Roku 3. Yep, you can binge on Netflix and Hulu using the library accounts! If you’re curious about how much energy consumption your appliances are using, borrow a Kill-a-Watt or check out a Speck Sensor to monitor the air quality in your house. You can even borrow a projector, projector screen, and a solar speaker. “The loan dates range from four to 21 days based upon the popularity of the item,” says Goodman. You don’t have to shell out a lot of cash for an outing to the museum or theater when you have a library card from the Tampa-Hillsborough County Public Library in Florida. The Discovery Pass service will get you in the door for free at such places as the Glazer Children’s Museum or a Stage Works Theater Performance. “The Discovery Pass is a great way for all Hillsborough County residents to have the opportunity to enjoy cultural enrichment,” says Jennifer Hodges, supervisory librarian. There are a specific amount of passes offered for each experience but you can easily place a request, and when the pass is available, you take your outing. Here’s why you should make time to read every day. Interested in adding photo-editing or computer drafting to your skill set for free and in the convenience of your own home? “Lynda.com is an online learning platform that helps anyone learn business, software, technology, and creative skills to achieve personal and professional goals,” says Chely Cantrell Manager of Library Development Tampa-Hillsborough County Public Library. Well-known titles like Adobe, Dreamweaver, AutoCAD, and Final Cut Pro are all available to learn at the library—or in the comfort of your own home. “Buddy Up and Read is a literacy program at Columbia Heights Minnesota library [in Minnesota] that connects an English reader/speaker with an English-as-a-second-language learner,” says Paul Cram, a volunteer with the program. He read with a woman from China out loud for an hour each week; she went on to launch her own small business. “I am so happy to have been a part of helping her to learn reading and pronouncing English to the point where she had such confidence,” he said. These are the 20 books everyone should put on their reading list. Vacant rooms in libraries aren’t just for quiet study time. In many libraries, a cardholder can reserve a small room or large conference room to conduct a business meeting or host a non-profit club like the Boy Scouts. Rebecca Gebhardt uses her library card to reserve a room to lead a women’s boot camp for business at the Hennepin County Library in Minnesota. There’s one critical rule for hosting a meeting. “The library has strict policies about using the rooms for business, so I had to assure them that I wasn’t collecting any money,” says Gebhardt. (Rules vary by individual library, so be sure to check with yours.) Here are the secrets librarians been keeping from you for years. Once school is out for the day, kids can walk a few blocks to the Twain Harte Branch Librayin Tuolumne County, California to get homework help. “We have a retired special education teacher and college professor who volunteer their time. The important thing is that they are both moms and recognize that students need a friendly, patient, helpful face after the hard work of the school day. This makes a wonderful connection between generations,” says librarian Sharyn Alomia. Whether you just moved into town or your kids have flown the coop, making new friends couldn’t be more fun than at your local library. If you like books, coffee and chatting then you’ll already be in good company when you attend the monthly Books, Coffee, and Conversation at the Arbutus branch of the Baltimore County Public Library. If your preferred genre leans more towards a page-turning mystery, join other sleuths to discuss a new title every month in the Mystery and Suspense Book Club. For the hands-on crowd register for a Saturday Crafternoon class at the Towson branch. Read these short books in a day and discuss with your friends tomorrow.